There’s been much talk recently about how Facebook’s move to location-based features will impact services such as Foursquare, Gowalla and the like. Whilst everyone debates who will be crushed/acquired first, I think it’s time for some other companies to start shaking – online & mobile ad networks. 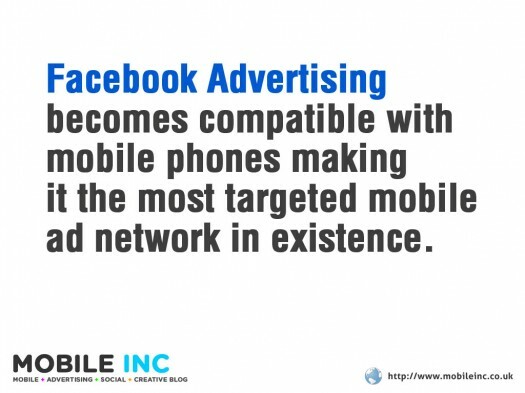 Back in early 2009 when I was doing mobile advertising mashups at Nokia, I spent a lot of time thinking about how to use someone’s Facebook social graph to create mobile ads that would be more engaging for users. My main goal was to combine the features of the Nokia device (location, music, games etc) with the immense amount of data Facebook has about you and your friends, resulting in highly relevant and targeted ads. I started to really get stuck into Facebook Advertising, which is Facebook’s ad network used for running those tiny ads you see around the sidebar and various other places on the site. Anyone can go in and place an ad but the killer feature is the huge amount of targeting options available to you. From age all the way through to interests, and you can also target by applications installed, even events! (Check out my own campaign for an example). It quickly dawned on me that Facebook was in a perfect position to turn this into something that could give Admob a kicking. In August Facebook launched its location-based feature on the iPhone called Places. It enables users to ‘check-in’ to wherever they are and push that location to their news feed for friends to see. This means that not only can they add your real time location to the list of targeting data, but also all your friends locations too. The possibilities with all this information are endless for advertisers. There’s already rumours of Facebook testing a Places powered deals service which rewards a user with freebies for checking-in at a location with 3 or more friends. It’s not hard to imagine what a easy transition it would be for Facebook to become a fully fledged mobile advertising network. All they need to do is connect the dots between Facebook Advertising, Places and Connect. I’m not talking about running text and banner ads on their app and mobile site, I’m talking about the bigger picture, taking on Google and Apple. Think about this – mobile ad networks can already track when a user passes from one site to another. Let’s say your on the Guardian mobile site and you get shown an advert for McDonald’s and you don’t click on it, if you then go to the CNN mobile site and it’s within the same ad network, they can choose to not show you the same ad – because if you haven’t clicked on it the first time, it’s probably a waste of money showing it to you again. With that same logic think about how many people use Facebook on the mobile web, if users check their account then move off to other places on the web, your profile goes with you meaning that the ads you see on sites will be super targeted which will be better for you and the publisher. 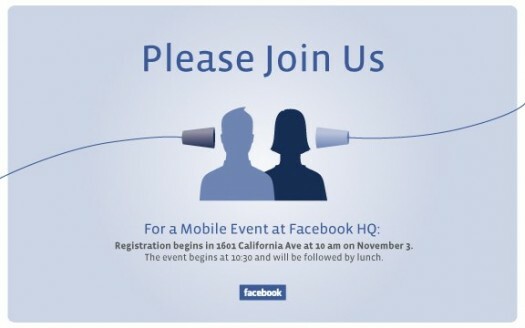 Realistically I think Facebook would need to expand their online advertising first, then move onto mobile. If this happens then Facebook can track you between your PC browsing and mobile, and I can’t imagine anyone other than Google that can really compete with that. Facebook Connect was made compatible with mobile last year, “With only four lines of code, developers can add a Facebook Connect button to their app in order to make it more social” said Henri Moissinac, head of mobile operations at Facebook. It doesn’t take much for Facebook to suddenly be nicking the iPhone/Android ad units from Admob, and there is just no way anyone could compete with the amount of targeting options available with Facebook. Facebook Places is still in its infancy, brands are still figuring out what to do with it, but with Facebook’s rapid development cycle you can be sure that within 6 months they’ll be a dozens of new features added – then who knows what? Facebook are due to hold a mobile event this week and although I think it’s a bit too early for them to shock the world with an announcement that they are taking on Google, this can’t be too far away as they pass 150 million active mobile users. These thoughts plus a few other random ones were in my 2010 predictions here. is it right that facebook has to became the Mobile Advertising Network ! They could boost the followaroundability of their ad platform by buying (or building) a company like http://www.criteo.com (Paris based, globally active). I like your thinking here. Can a FB app dev put multiple FB ads on one canvas? or do they only appear in the sidebar?